What happends during the first stage of respiration and where does it happen? Respiration is the process where cells get energy from glucose. In respiration, cells break down simple food molecules, like sugar, and release the energy they have. All living things carry out respiration because they need a constant supply of energy. Both plants and animals respire. The first stage of respiration happens in a cell’s cytoplasm. It involves glycolysis. It's an anaerobic process meaning it doesn’t require oxygen. 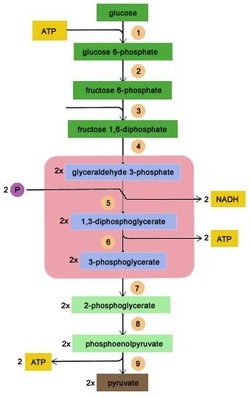 In this process, the glucose molecules are broken down into 2 smaller molecules in a ten step process.